Despite spending the past year mostly blogging about my seemingly endless battle with clutter (and how to creatively transform that clutter), after a week of eating dinner on the floor and sleeping on an air mattress that requires a nightly topping off (and still isn't that comfortable, even after a west coast upgrade), I am pretty much living for Friday, when we're schedule to receive and unload our Pod. 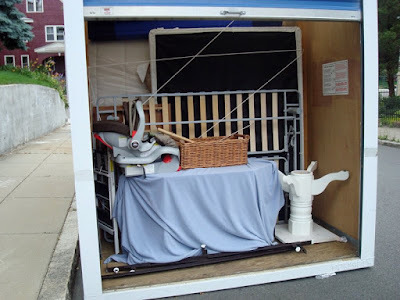 In fact, our moving crate is already in the area, having arrived in nearby Hayward today but because of schedules and parking permits and other such nonsense, Friday is still the earliest we can get at it. More on the move later, as well as the bizarre but ultimately pretty great experience of being back in my old/new neighborhood.